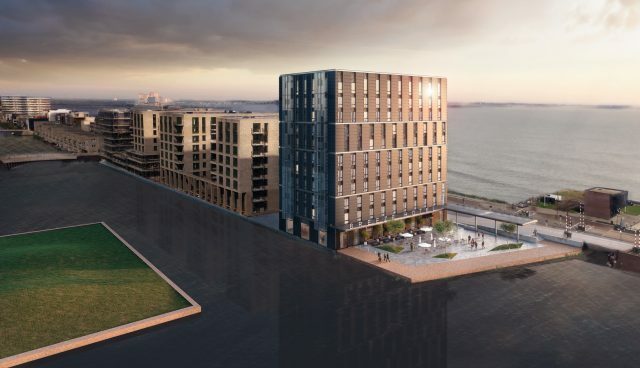 Spending a night in the world’s first virtually zero-energy, high-tech hotel, will soon become a reality at the harbor of IJburg, Amsterdam. 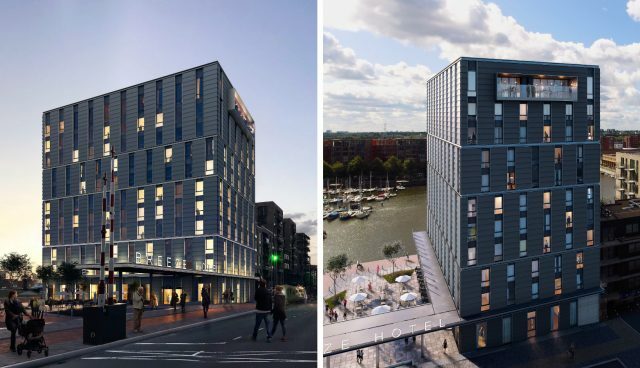 Hotel Breeze was designed as a unique and innovative concept, resulting in the first (n) Zero Energy Hotel, with a BREEAM ‘Excellent’ certification. Hotel Breeze was designed in such a way that it harnesses sunlight and wind to heat and cool the living spaces. This smart combination of solar heating with specialised air circulation provides naturally heated water as well as ventilation to the rooms. In a way, the Breeze building can be seen as one large and natural air-conditioning system. 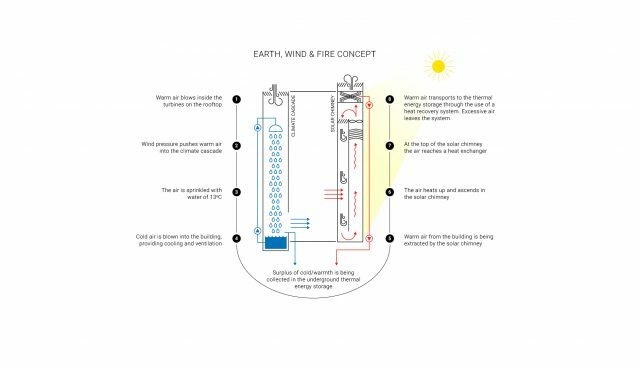 The Earth, Wind & Fire (EWF) concept was developed throughout the building design and installations. The façade, rooftop and canopies at each side are fully coated with photovoltaic cells, creating a modern look. The inside of the building expresses the unique nature-driven narrative of the sun, wind and falling water droplets, as the important ingredients in order to cool, ventilate and heat the hotel rooms of this 11 storey building. The “solar chimney” on the south side offers sun driven ventilation and heating that can reach temperatures of 60°C. The climate cascade, besides cooling, provides air cleaning. The building with its height of 36 meters, consists of the following main elements; a solar chimney, a climate cascade and a power façade. The 198 “Zero Energy” rooms are situated from the first to the ninth floor. The tenth floor includes a fitness room and a club with skybar. The huge balcony of the skybar has a grand view over the water of the IJmeer. Hotel Breeze is located at the head of the harbor on a public square, which together form a strong urban ensemble. In 2008 Dr. Ing. Ben Bronsema introduced the Earth, Wind & Fire concept and successfully promoted it five years later at the Technical University of Delft. The film below provides an introduction to the Hotel Breeze building.